Got some questions? Please feel free to give us a call on 0800 244 644 or email info@bignightout.net.nz & we will be more than happy to help! Otherwise check out our list of frequently asked questions for our Queenstown pub crawls! What is the Big Night Out Pub Crawl? Big Night Out is the original & best pub crawl in New Zealand. Visiting the best clubs, pubs, bars & nightclubs in Queenstown. 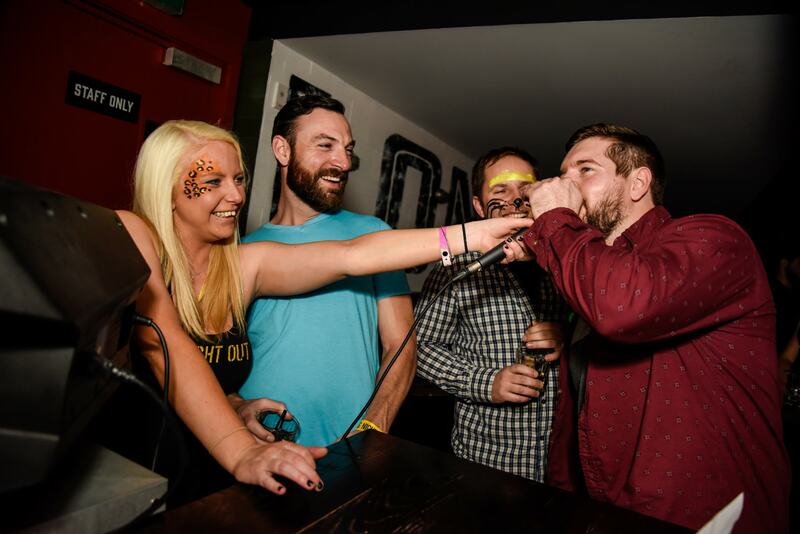 The Big Night Out Pub Crawl is the ultimate nightlife experience! With hilarious party games, tonnes of inclusions & loads of fun! What nights does the Big Night Out Pub Crawl run? The Big Night Out runs a party tour every Tuesday, Wednesday, Thursday, Friday & Saturday night, all year long! We also do a range of SPECIAL pub crawls for events like New Years Eve, Easter Weekend, St Paddy’s Day, Gay Ski Week, Winterfest, Halloween, just to name a few! What nights does the Ice Bar Pub Crawl run? On Wednesdays & Friday nights you & your friends can upgrade from a standard Big Night Out Pub Crawl to an Ice Bar Crawl! The BNO crew take you to the best Ice Bar in Queenstown – Below Zero Ice Bar for a truly unique & worthwhile experience! Where do I meet the Big Night Out crew? On every Big Night Out Pub Crawl our crazy crew meet all our party guests at Vinyl Underground for 9pm. It is underneath World Bar at 12B Church Street, Queenstown. If you can see Devil Burger we are just over the road! It is easy to find, so don’t sweat it! What Queenstown bars & clubs does Big Night Out Pub Crawl visit? We only use specially selected Queenstown bars that are ready to keep the party vibe going and can handle our crazy antics! These are subject to change because we don’t decide a final line up until we have done our research for the night & know we are giving every Big Night Out Pub Crawl guest the best Queenstown nightlife experience possible. How do you get from pub to pub? Big Night Out Pub Crawl is a walking tour. Our team of fully trained professional hosts will guide you from bar to club to pub throughout Queenstown. There is no need to worry about a thing, we take care of it. Our staff will be strategically positioned at any twist and turn to make sure you get from club to club in a fun and safe way. What sort of identification do I need? Do I need to bring my passport? Legally, you are expected to bring a NZ driving license, NZ 18+ card or your Passport. If you are an Aussie or Brit & don’t trust yourself with your passport (Who does? ), there are no guarantees, but most of the bouncers can use their discretion. That is, if they are from the same country or worked as a bouncer in that country, you can usually use your own country’s driver’s license. Don’t give them a reason to say no, smile, don’t act tipsy & always be polite. Don’t fear, we are in the first bar for 45 minutes. We know you girls like to take your time, and we don’t want anyone to be stressed! After all, we are here to have a great time! What am I allowed to wear? Is there a dress code? Pretty much anything goes in terms of dress code in Queenstown. We’ve never seen anyone get refused with flip flops/jandals/thongs on but, to be safe, we recommend you stick to enclosed shoes. Just in case there is any glass on the floor. When does the Big Night Out Pub Crawl finish? How much does the Big Night Out Pub Crawl cost? It is $30 on a standard night; however, you can upgrade to an Ice Bar Crawl on Wed & Fridays for an extra $10. Queenstown New Years Eve Pub Crawl and nights leading up to it is where the price goes up because they are a sellout event every year, and worth every penny! Yes, you can if you come party with us for a 2nd night in a row! When do the bars close in Queenstown, New Zealand? The bars, clubs & pubs in Queenstown, New Zealand close between 2-4am depending on their liquor license. What can you do for my mate’s birthday? We will make sure your mate has the time of their life. We will give them a list of naughty tasks to do throughout the night that they must accomplish. Our professional MC host will give birthday boys & girls shout outs on the mic to make sure everyone knows it’s their special day. Do we need to book our tickets in advance? Only the crawls leading up to & including New Years Eve is essential, as this a sellout Queenstown event! It’s easy to book your tickets online and it helps us plan the route, games and prizes if we know more about your group and if you are celebrating a special occasion. What beverages are available on the tour? The beverages available vary in every bar and we always have a non-alcoholic option for those that prefer not to drink. Please mention this to the BNO staff upon arrival to ensure you get your non-alcoholic drink. Do you supply any food on the night? Yeah we do, who likes FREE PIZZA! We often visit the two best pizzeria/bars in Queenstown, Winnies & London. Tell us which one has the best pizzas because the BNO crew can’t decide. What happens if you get intoxicated? Unfortunately, if you are deemed overly intoxicated on the pub crawl the venues will not allow you to enter. We always recommend that you drink plenty of water, eat plenty of food, so you can remember your fun night with us in a safe way! What are the hotels nearby?